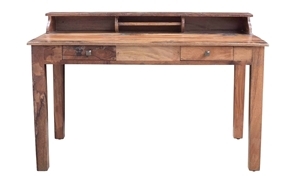 Handmade solid wood writing desk made from reclaimed teak and other materials. Features two drawers with hammered iron pull knobs. 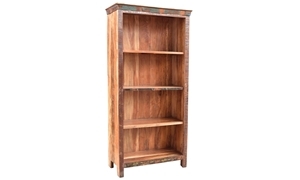 Handcrafted 4-shelf open bookcase features weathered distressing that highlights the reclaimed teak and solid wood. 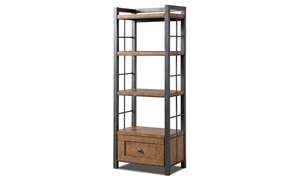 60-inch tall bookcase creates a stunning display space with four shelves and a full extension drawer inside a burnished pewter frame. An iconic workshop design gets a chic update with this 60-inch desk showcasing distressed oak veneers in a wheat finish. Credenza and matching hutch provide ample display and storage space with features like LED touch lighting, AC/USB charging and more. Traditional half pedestal desk features an ergonomic Partner’s curve and four drawers in a wire brushed truffle finish. 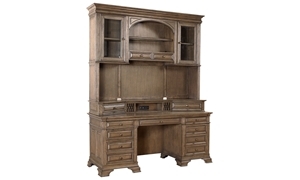 72-inch desk combines traditional style with modern convenience. Features seven full-extension drawers and two power outlets. Cherry inlays and hand finished bronze hardware make this executive desk perfect for any stylish home office. 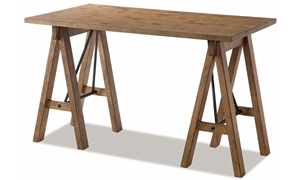 A warm burnished finish over a simple silhouette makes this writing desk perfect for most any home. Your home office can be as comfortable and beautiful as the rest of your home when you furnish it at Haynes.